by gillian claire: Friday Favorites! Happy Friday! I don't exactly know where the week went, or where March went for that matter! We've had some amazing warm weather recently but today it is rainy and cold in Colorado and I'm ready for Spring to reappear! 1. It makes way too much sense that my first thing on this list is sweatpants... I actually won these in a contest on Instagram you guys and I was SO excited! I seriously never win anything but I entered this contest that Friday Faves was running and I got to pick out anything from their site when I won! Of course I picked these jogger sweatpants because I'm the most comfortable person alive... and they are soooo cute + perfectly comfy! Also, you won't believe this but after winning these, I received an email that I won some skincare products in another contest that I entered on a blog I follow! Just call me lucky-lucky. 2. Ok so in full disclosure, these products were sent to me for free from Influenster BUT I am not obligated to blog about them and I really, really love them! If you have read any of my skincare posts you know that my face has been struggling these past few years. I was really nervous to try out anything new on my skin because it feels like the slightest change puts my face into full breakout mode. I bit the bullet and tried these Ole Henriksen products though and they have really dried out (in a good way) my skin and given me a better complexion! I am completely swapping out my old skincare routine for this one. I'm still looking for the miracle skincare answer but this trio is a big step up from what I had going on! 3. No photo for this one BUT you guys, the show Jane the Virgin, where has this been all my life. This show never appealed to me but in my desperate-to-find-a-show panic one night I tried it and I'm hooked. Who else has watched it?? 4. Oh hey, some more skincare! This is something I've been trying to incorporate more into my blog + I have been loving trying out some new products lately! 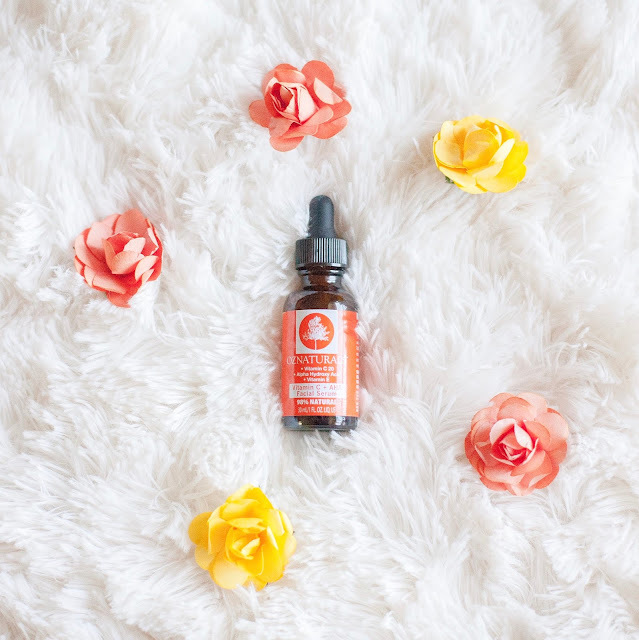 Check out my recent "First Impressions Skincare" post to see my thoughts on this OZNaturals Vitamin C Serum as well as a couple other new products. 5. When I'm not wearing sweatpants + workout tanks then I'm wearing graphic tees + leggings... ha! I love this "weekend i'm in love" tee from Target. I couldn't find the exact link but here's a similar one. (affilate link) So many cute shirts in the Target juniors section right now! Well I'm off to try and re-laxxxxx on this dreary Friday. What are your weekend plans? I'm so glad to see your positive review about Ole Henrikson face stuff! I've heard good reviews but I, too, have skin that seems to go crazy when I change up my routine! Thanks for reviewing! Loved reading your Friday Faves! My sister was just visiting and is all about Jane the Virgin so I feel like I have been missing out! Need to check it out! Sweatpants and graphic tees are my jam! And, I've not watched Jane the Virgin yet but I hear it's good! OH WOW!!! YOU won those?!? That is awesome! 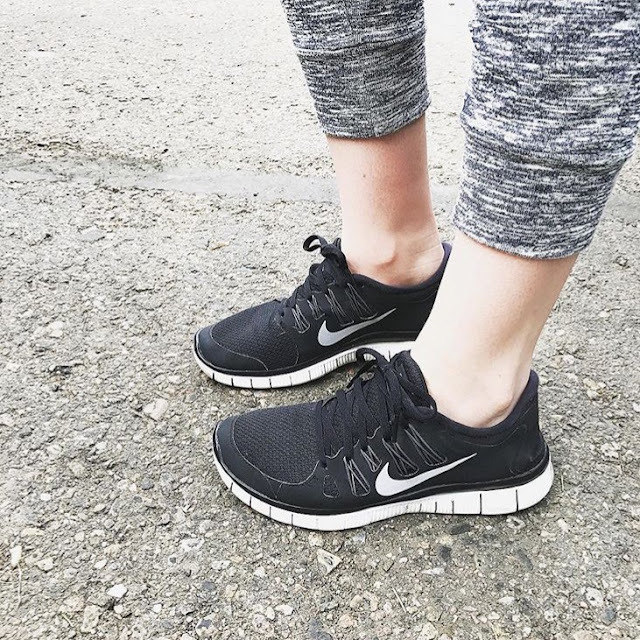 I love nike frees. They are literally the comfiest sneaker. I need to have those sweats in my life!! I never have any luck with Influenster, but you're making me want to keep at it! I'd pick those pants too!